The one good thing about having a ridiculous amount of TV channels is that there is ALWAYS something on. Thats how I came across the movie 'Miss Pettigrew Lives For A Day'. It starred Amy Adams and was such a sweet, fun little movie. 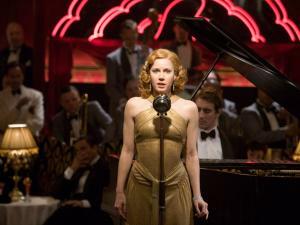 It was set in the 1930's and Amy Adams had some gorgeous outfits on. The movie took place over one day, so it was good to see a lot of outfit changes. I wish I could look this good while lounging about at home. I loved her in this silk wrap, and particularly love the furs she got on. And the look is so cute and girly. I thought this was a really great outfit. Again, I'm loving the colour. My favourite thing about this outfit is the hat: It looked so great. Along with the fur and the gloves, this outfit was really elegant and fits in so well with what was around during the 1930's. I know you really can't see this one properly, but at least you can see the detail on the side. It was a pretty dress and fit her so well. What made me love it even more was the cute hairclip she has on. I think she had an equally pretty one on on the other side as well. This was by far my favourite dress. I couldn't get a proper picture of it, but the neckline was simply amazing. I think you can kind of see it in the first picture. The neckline crossed across her neck and had shiny brooches on either side. The colour of the dress made it really glamourous as well. I liked the design of this one. It was well cut and the hat was beautiful. And I'm in love with the brooch she has on. Oh I love this film! The clothes are so beautiful and the decor and everything! Love these looks, especially the last one! Will have to see this movie! I haven't seen this movie but all of the looks are fabulous! I wish I looked that good while lounging at home too! Very elegant... such classic pieces. I have seen Amy Adams in Disney's "Enchanted", and I've been dying to see this one as well! She has worn the most beautiful outfits in all her movies, from what I have seen! I so loved this movie and have probably watched five times!!! 1930's Fashion is exquisite! It's hard to believe women managed to look so put together even though THe Depression was ruining so many people's lives! beautiful wardrobe! i must see this movie now! thank you for sharing! I had loved the book and found the movie delightful. Amy Adams radiates. amy adams is so adorable! it makes me want to put a rhinestone clip in my hair and silky 30s inspired numbers. I really want to see this film! And the outfits are gorgeous, especially the 1st. I'll be at the New Look press day on the 3rd, around 2/3pm ish. Hope I see you there! I've been meaning to watch this movie forever because of the gorgeous outfits. Thanks for the reminder, lovely post. Gorgeous outfits! I can't work out which one I like the most! I need to check out this movie asap. LOVE LOVE this film and all of her beautiful vintage outfits!